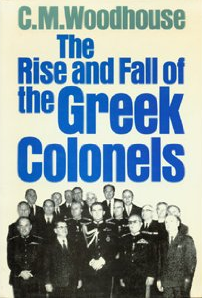 The book "The Rise and Fall of the Greek Colonels" by C. M. Woodhouse was published by Granada Publishing Ltd., London in 1985. I have transcribed the 134 names mentioned in this book along with the Table of Contents for your review. If you are interested in this book it is available through the U.S. Inter-library loan program, you can work with your local library to obtain a copy.